The way it all went down was like this. I was sitting in a friend's house eating essential oil infused food that was ridiculously good and hearing these other women talking about oils and which oil they use for what. I was clueless when it came to essential oils....really and truly clueless. "I wonder if this is just a bunch of hullabaloo." Y'all, it's what I was thinking. And the gal next to me munching hard on the cinnamon infused apple slices and orange infused dipping cream with the notebook....A NOTEBOOK...of things she needed to buy or try or borrow or Google. Ugh. It was almost too much for me. "Y'all have seriously lost it. I'm hoping to maybe win a prize by being here." After eating I drank my water and headed into the living room with the others to look at catalogs and talk even more about essential oils. I remember seeing pages of "Thieves" items and thinking, "What in the ever loving....Thieves? This is exciting? Why is this woman saying she needs all the Thieves for her cruise coming up?" I.was.lost. on this essential oil craze. The hostess acknowledged that I probably didn't really know much about oils and told me not to worry. She asked me a simple question: "If you could use oils for anything, what would you use them for?". Well, I told her about something I was worried about and she got up, grabbing bottles of oils off a shelf and took them into the kitchen. She brought me back a roller bottle blend of oils and said "Try this and see if it helps". Then she told me to just roll the oils all over the feet and put socks on at night. Hm. OK. I was going to try it. Y'all. After 2 nights of zero issue, I was in tears. I was messaging this girl and saying "What did you put in that blend you made? How do I get more when I run out? What in the world was the starter kit thingy-ma-bobber you were telling me about and how much is that?" Soooo many questions but I knew that even if I wasn't crunchy, I had just found a way to help my family...my sweet kiddos! I needed to know more. "Ugh...it costs that much? We don't have money like that. The hubs will never let me." I found wonderful ways to stretch the oils I had and make them last as long as possible. I also learned how to save money on buying more! I HAD to figure this out. 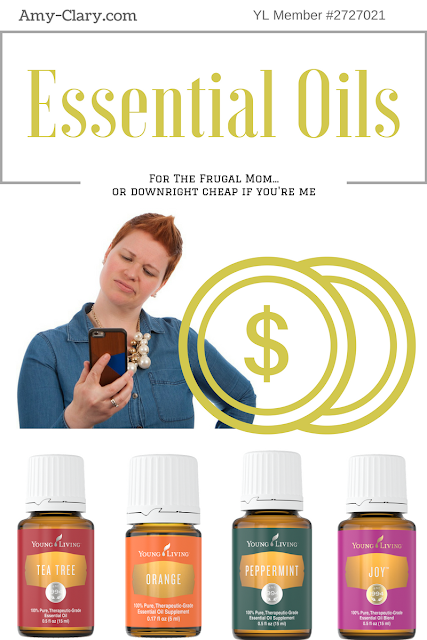 We honestly couldn't afford to just dive in to essential oils but I knew that I had seen the benefits of using them and wanted that in my home for myself and my family. So....how to stretch and save? I have a few simple steps for you! DILUTE, dilute, dilute. I don't care if your'e going to use one essential oil on its own or if you're going to make a blend like my friend had made for me. Dilute those essential oils and get the most life out of them as you can. I have little jello shot size cups all over my home of coconut oil and 1 or more essential oils just waiting for when I need them. I also have about a dozen glass roller bottles that I filled with grape seed oil and the 1 or more oils I needed in there for a cleaner application and an easy way to toss it in my purse and take on the go. In a cup, I only need to add about 9 drops of oil to the coconut oil I filled it with. In a roller bottle (10ml), I need anywhere from 12 to 20 drops of oils added to the grape seed oil I filled it with. This way, the oils last a long, long time before I need to replace them. It's far more efficient than diluting as you're applying. Use less in your diffuser than the handbook says. I only use about 2 or 3 drops of essential oil in my diffuser that's filled with water. I still get amazing benefits and I don't run out as quickly. Also...I sometimes turn off my diffuser after it's been running for 30 minutes. It takes a body 30 minutes to absorb the benefits of the essential oil(s) and after that, it just smells nice. Running it longer is not more beneficial but it's not harmful, either. Turn it off and then come back in a couple hours to turn it back on again. Of course, if it's in my kiddos' room for rest, I just leave it running. Bite the bullet, become a member, and enjoy your 24% off. I could have easily signed up to be a retail customer (and you can, too) but I hate paying retail price for anything. A discount always helps. After you've become a member, sign up for Essential Rewards. Here, I'm getting free oils with my order every month AND earning points to get MORE free oils on a quick order in the future. Please believe, I hoard my Essential Rewards points and use them to buy gifts for people or to save up for that really pricey item I want but can't squeeze into my budget. Share, share, share. Why? Because when you share about your oils and YOUR story, people may be intrigued and want to get a kit, too! And do you know what happens when your friends want a kit, too? You can make cash money. (YES, PLEASE!) I'm at a point where I get free oils all the time, totally able to support my own Essential Oil loving habits.